Okay, now this is interesting! Armed with intellectual genius and a dangerously inventive mind, Iron Skull is a powerful ally to evil. If you don't recognize Iron Skull, don't feel bad - this isn't from some obscure comic storyline you haven't read. It's available as a Superhero Masher, but it didn't originate there; it appeared in the failed Playmation game, but it didn't originate there; there was a version in a Lego set, but it didn't originate there, either; rather, it comes from the Avengers Assemble cartoon, where Red Skull stole Tony Stark's Mark 49 armor and had MODOK modify it for his use. 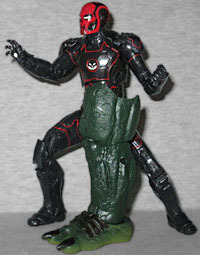 This figure is a repaint of the A Good Day to Avenge Hard Mark 43, which was itself a repaint of the Iron Man 3 Mark 42. The shapes don't exactly match the cartoon design, but then, this isn't meant to be the cartoon design: it's a comic version. Untooned. The fact that he's dark grey with thin red lines is enough. Well, that and the skull symbol in the center of his chest. 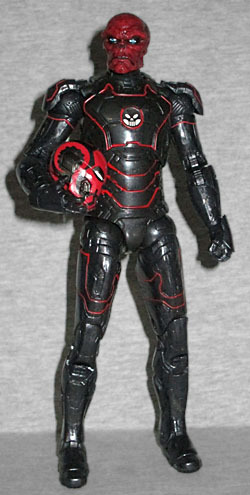 While the figure does come with a plain Red Skull head (taken from the Cap 2 figure, but with a dark wash to bring out the details), he also has an alternate - it's the Iron Man helmet, of course, but it's been decoed to better suit the Skull: a stylized red pattern on the front makes it look skeletal, while tenticles, suggesting his connection to Hydra, curl along the jaw and temples, and up the back of the head. It's a rather sharp design, created specifically for this toy rather than for the cartoon or any of the previous versions. Sadly, Iron Skull has no other accessories - no repulsor blasts, no exhause plumes, no Cosmic Cube, just the helmet. He does include a piece of the Abomination Build-A-figure (the left leg), but that's to be expected. Not since Dreamwave taught the world that a white Optimus Prime toy would sell has a second-party idea for a repaint been so thoroughly embraced by toymakers. We've had Red Skull in weird armor before, and while this one isn't taken from the comic like that one was, it's an unexpectedly cool toy. Plus, the fact that Marvel Legends is healthy enough to support non-comic costume variations is a good sign. This entry was posted in blog exclusive review, Hasbro, Marvel and tagged Avengers, Captain America, Hulk, Iron Man, Marvel Legends. Bookmark the permalink.